Habitat and Ecology: Euphorbia brachyphylla is found on rocky slopes on gneiss and cipolin limestone rocks in xerophytic bush. 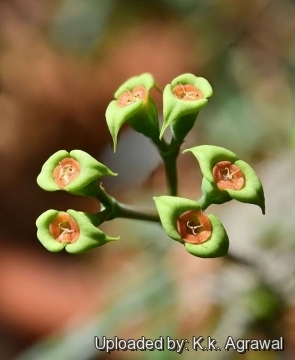 The species is threatened by habitat degradation, fire, collection for horticultural trade. The localities are very imprecise and the species may prove to be Critically Endangered, but further field studies are required to assess if it is not synonymous with some species described by W. Rauh from exactly the same localities. Description: Euphorbia brachyphylla is a spiny succulent shrub, 1-1.2 m tall, scarcely branched, with hairy spines at the ends of the branches accompanied by smaller spines, with green-yellow to salmon-pink flowers. 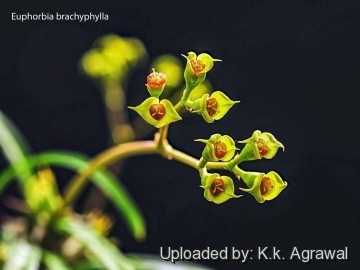 Derivation of specific name: “brachyphylla” from Greek brachys (βραχυϛ ) short, little and phyllon (φυλλον) leaf; foliage. Hence short leaved. Stem: Branches l cm thick. Leaves: Linear, 5-8 cm long, 3-9 mm wide, apex shortly apiculate, base narrowed; petiole short. Stipular spines:basally flattened, to 7 mm long, densely white pubescent, later glabrate, accompanied by smaller spines. Flowers: Aggregated into a cluster of flowers called a cyathium (plural cyathia). Similar species: The main difference between Euphorbia rossii and E. brachyphylla lies in the structure of the inflorescences. These are long-stalked dichasia with few cyathia in E. brachyphylla. The inflorescence peduncle is usually covered with bristles. 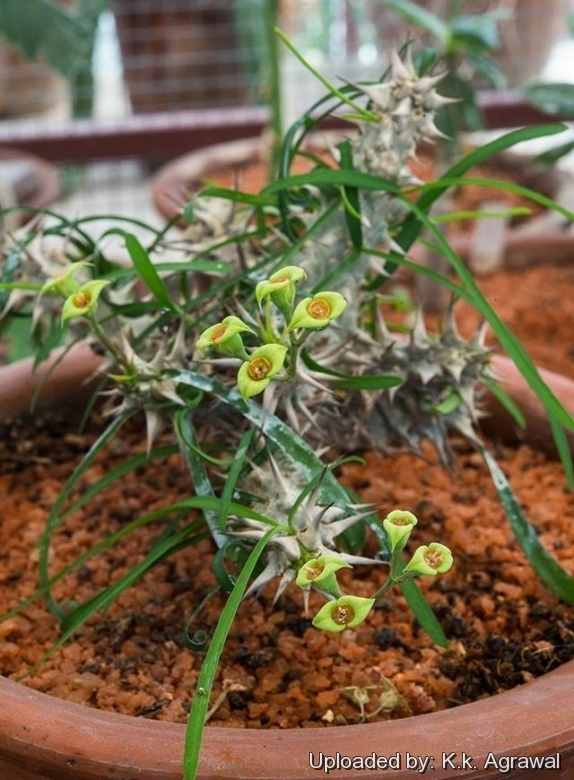 E. brachyphylla is also strictly related to Euphorbia gottlebei. 1) Haevermans, T. 2004. “Euphorbia brachyphylla”. The IUCN Red List of Threatened Species. Version 2014.3. <www.iucnredlist.org>. Downloaded on 05 April 2015. 2) Leandri, J. 1935. “Euphorbiaceae”. Cat. Pl. Madag., Euphorb. 2(23): 1–51. 3) Ursch, E. & J. Leandri. 1954. “Les euphorbes malgaches epineuses et charnues du Jardin Botanique de Tsimbazaza”. Mém. Inst. Sci. Madagascar, Sér. B, Biol. Vég. 5: 109–185. Cultivation and Propagation: Euphorbia brachyphylla is a slow-growing and cold-sensitive species, it can to grow in both pots and in the ground, in areas with a mild climate, but they can even be grown indoors. They grow well in a very draining mineral potting substrate. During the summer, they enjoy average feeding and watering. Hardiness: When dormant, plants are relatively cold-tolerants, but for safe cultivation it is best to avoid temperatures below 10° C.
Propagation: Usually by seeds, it can also It be propagated by cuttings; if you remove an offset, remember to let it dry for a week or so, letting the wound heal (cuttings planted too soon easily rot before they can grow roots). It is better to wash the cut to remove the latex. Warning: As with all other Euphorbias, when a plant gets damaged it exudes a thick white milky sap known as latex. This latex is poisonous and may irritate skin, so pay extreme attention not to get any in your eyes or mouth.